Armed and ready for battle, the all-new ‘Gideon’ is WASPcam’s premium camera model, pushing out serious pixel-power, higher frame-rate quality and allowing no room for error when it comes to capturing the best shot, thanks to WASPcam’s new Live Viewing Display (LVD) Wrist Remote! Where the Gideon really destroys competitors is with its feature-rich LVD: a wireless wrist remote, which connects to the camera via Radio Frequency (RF), providing users with a LIVE viewing screen and remote control for their Gideon. The LVD connects to a Gideon from up to 5 metres away and also acts as a real watch, displaying time and date. 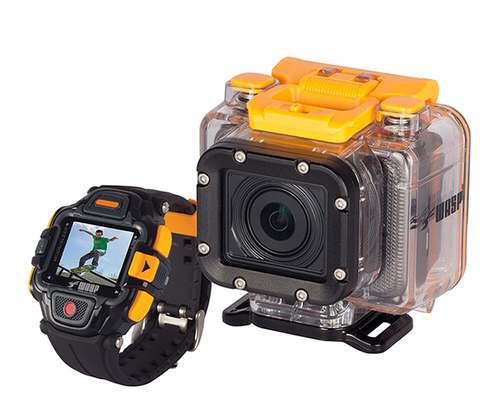 Both the GIDEON (when installed in its waterproof camera casing) and its wireless wrist remote are waterproof down to 60m. Auto-Looping Function: video records over itself—perfect for automobile applications or continuous video recording!